“Crazy making” is a term one hears a lot in counseling and psychology. It basically means what it sounds like: Behaviors and actions — often intended — that create stress, confusion, and anxiety, and sometimes make people question their judgment and even sanity. There are lots of overlaps between workplace bullying and the concept of crazy making, in ways that validate bullying as a form of psychological torture. In this post I’m drawing on previous commentaries in an effort to understand those interrelationships. …a form of psychological abuse in which false information is presented with the intent of making a victim doubt his or her own memory, perception and sanity. It may range simply from the denial by an abuser that previous abusive incidents ever occurred, up to the staging of bizarre events by the abuser with the intention of disorienting the victim. When I wrote a post about gaslighting as a workplace bullying tactic in late 2012, I never imagined that it would still be getting dozens of “hits” each week from online searches today. But now I informally nominate it as one of the most pernicious forms of individually targeted, crazy making behavior in the workplace. If you doubt my assessment, do a search using “gaslighting” and “workplace” and you’ll see why I’ve reached this conclusion. Ostracism is among the most stress-inducing of workplace bullying tactics. Imagine going into an office or plant every work day, only to be greeted by silence and avoidance from your co-workers. It’s a silent form of mobbing or “puppet master” bullying. Ostracism is painful to endure and can fuel paranoid, hyper-vigilant emotions, especially when experienced over an extended period of time. Workplace aggressors are often experts at button pushing. They know how to get a rise out of someone, and if it causes the target to say or do something that gives the aggressors even more of an upper hand, then all the better. Under stress, targets can engage in self-defeating behaviors, and crossing the line in responding to abusive work situations is a frequent one. Workplace bullies sometimes claim to be the victims of workplace bullying. And the smartest aggressors often are experts at doing this. The typical scenario is when bullying targets retaliate or act impulsively toward their aggressor(s) out of exasperation, fear, or anger. That response provides reason for the aggressor(s) to claim victim status. The target is put in the crazy making position of having to explain/defend his actions and being on the defensive. The organizational embrace of a superficial brand of civility can advantage those who engage in bullying, harassment, or discrimination at work. It often starts with mistreatment masked by a steady, calm demeanor. This may include behaviors that are calculated to be plausibly deniable, such as bullying by omission (e.g., exclusion and ostracism), “lighter” forms of harassment, or indirect discrimination. An individual who protests such mistreatment, especially in loud or allegedly disrespectful tones, may be accused of violating unofficial or official codes of conduct and may be called to answer for “inappropriate” behavior. Bad organizations choose to “forget” less flattering events of their institutional history and the individuals associated with them, especially whistleblowers whose allegations threaten their self-generated mythologies. Those individuals will be conveniently rendered “unpersons,” an Orwellian term for an individual whose existence is more or less expunged. Those who later try to remind organizations of these transgressions are criticized for talking about “the past,” even if the events in question occurred very recently. If they bring up that past too frequently, they risk being pushed out and turned into unpersons. It takes a pretty twisted individual to engage in a campaign of crazy making bullying against another. I believe the most likely candidate for this type of aggressor is the so-called “almost psychopath,” a term coined by psychiatrist Ronald Schouten to capture those individuals who fall short of meeting the clinical definition of a psychopath but who nevertheless possess characteristics such as a lack of empathy and a willingness to engage in harmful behavior toward others. Almost psychopaths can function within the boundaries of society and often are very skilled at manipulating others and covering their behaviors. Boomers and workplace bullying: Cause or cure? So what are you willing to do about it? I ask because many boomers are in management and as a result, some are in a good position to take action. Even if you’re not among your employer’s leadership team, you still might be able to make a difference. If you’re well respected by colleagues, have good relations with key influencers at your employer or have strong job security, it’s likely easier for you to speak up and get management to take bullying seriously than it is for your younger co-workers. In fact, Namie argues that younger generations (including the boomer’s kids who were groomed on the intolerance of bullying throughout their school years) will be the ones who make bullying unacceptable sometime in the future. Collamer goes on to suggest familiar ways in which individuals can help to prevent and respond to bullying behaviors at work. I’m a big fan of the PBS Next Avenue website, and Collamer’s piece echoes its generally optimistic view of how folks in the 50+ age cohort can live meaningful, impactful lives. On this question, however, I believe that Gary’s perspective is more realistic. It’s not to say, as Collamer suggests, that Boomers cannot make a positive difference here. Rather, with the exception of those who have experienced or witnessed workplace bullying close up, many Boomers simply don’t get it. Boomers — as a group — are in positions of considerable power. Many are managers, directors, presidents, department heads, and senior executives. However, it’s clear that many Boomers in positions of leadership are condoning, enabling, defending, supporting, or perpetrating these behaviors. Midlife correlates with an increased risk of being bullied at work, suggest the results of a Workplace Bullying Institute instant poll released earlier this month. Will it be up to the Millennials? The success of Collamer’s article is in bringing this topic before an audience that needs to hear the message. Until that message sinks in, we’ll continue to see executives complicit in workplace bullying, defended by lawyers denying that any such behaviors have taken place, and bolstered by corporate lobbying groups that oppose legal protections against targeted abuse at work. In fact, I believe that the passage of workplace anti-bullying laws will be among the spurs toward getting Boomer executives to take workplace bullying seriously. The mere threat of the Healthy Workplace Bill being enacted already has prompted some management-side employment lawyers to advise their clients to adopt workplace bullying policies. Or maybe, as Gary suggests, it will be the Millennials, raised on the idea that bullying is wrongful behavior, who bring our society to the next level on this. If so, perhaps generations hence will look back at the largely Boomer-led, top-down organizations and wonder how we could’ve been so misguided. What if a simple one-question test could “out” the narcissists in your workplace? Narcissistic Personality Disorder is characterized by a long-standing pattern of grandiosity (either in fantasy or actual behavior), an overwhelming need for admiration, and usually a complete lack of empathy toward others. People with this disorder often believe they are of primary importance in everybody’s life or to anyone they meet.…People with narcissistic personality disorder often display snobbish, disdainful, or patronizing attitudes. To find a narcissist, just ask them all to stand up. According to a new study (based on 11 separate experiments), the 40-question diagnostic test for narcissism can often be skipped in favor of a single, blunt question. Together, the 11 experiments showed that individuals who scored high on the old evaluation were very likely to respond in the affirmative. “It’s pretty cool actually, because narcissists aren’t afraid to tell you they’re narcissistic,” said Brad Bushman, co-author of the study and a professor of communication and psychology at The Ohio State University. But seriously, it’s telling that narcissists appear to be very willing to identify themselves as such. If they have no qualms about that, it’s no wonder that narcissism is associated with so many aspects of dysfunctional, hurtful behaviors at work, ranging from lousy management to severe workplace bullying. The extreme self-centeredness and absence of empathy can result in behaviors that destroy morale and livelihoods. Are narcissists over-represented in the ranks of management? Data on this issue is hard to find, perhaps nonexistent. Yet for a variety of reasons related to the nature of the condition and the qualities that often help one succeed in management, it’s reasonable to assume there’s ample narcissist representation. In other words, the higher we go up the organizational chart, the more likely we are to encounter narcissistic behaviors. And we know that such behaviors tend to roll downhill. How do creative geniuses and brilliant intellectuals spend their typical workday? 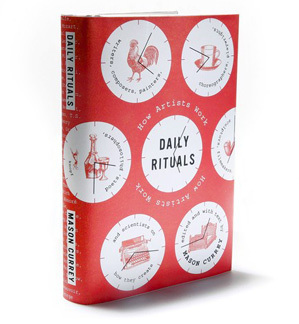 If you’ve ever wondered how great writers, artists, philosophers, scientists and other creators of art and knowledge greet their mornings and beyond, Mason Currey’s Daily Rituals: How Artists Work (2013) is a pleasing, easy way to find out. The book makes one thing abundantly clear: There’s no such thing as the way to create good work, but all greats have their way. And some of those ways are spectacularly weird. Of course, despite Burkeman’s prodigious mustering, there are many exceptions to each of these points. Also, the short, individual profiles are a delight to read; the essence of the book cannot be appreciated from a review. Most of those profiled come from the World Before The Internet. I wonder if Currey has a followup volume in mind on how today’s creatives are navigating the online world in terms of productivity and resources. In the meantime, I’ll hit “Publish” for this blog post and refill my coffee mug. “Transparency” is one of the buzzwords we hear in organizations, usually via leaders proclaiming they’re all about sharing information with their fellow workers. The benefits of transparency have been touted over the years in the business press, especially in light of the corporate scandals of the last decade. Of course, we know that walking the talk on this one can be an elusive quality, especially in the workplace. Personally speaking, the more an executive or manager proclaims their commitment to transparency, the more I question whether he will deliver. …[The study], published last week in the Journal of Personality and Social Psychology, suggests that when people have common knowledge, they’re much likelier to act in each others’ best interest. Social psychology has plenty of studies that examine altruism, but there hasn’t been much research that looks into its obscure cousin, “mutualistic cooperation”—that is, when people cooperate to benefit each other and themselves. It makes intuitive sense, doesn’t it? Common knowledge — the proverbial “let’s make sure we’re all on the same page here” — can lead to greater understanding and trust. Certainly there are instances where information cannot or should not be shared. However, as a general proposition, when employees feel treated respectfully and believe that key information is not being withheld from them, they are more likely to get beyond the us vs. them paradigm that typically besets poorly led organizations. In our efforts to advance the Healthy Workplace Bill (HWB) in the recently concluded Massachusetts legislative session, we started getting feedback from folks inside the State House at levels of frequency and intensity that we hadn’t heard before: Your advocates are making a difference. In other words, when our outreach coordinator asked HWB supporters to contact legislators at different points in the process, those supporters responded by getting on the phone, sending e-mails, and scheduling visits. While we fell short of the success we had hoped for, at critical points the HWB made it to next procedural steps and overcame opposition because of the voices of our grassroots advocates. This is a critically important development, and permit me to explain why. Many advocates for the Healthy Workplace Bill have experienced workplace bullying. In other words, they have been targets, and they know firsthand what this form of interpersonal abuse can do to people. They also understand how being bullied at work can be a lonely, isolating experience, especially when others around you dive for cover or start to keep their distance. That sense of isolation can create self-protective barriers that may make it difficult for targets to participate in a movement to create legal protections against how they were mistreated. And yet, we’re now seeing more targets coming out of the woodwork, joining with others to say that the law, among other societal institutions, should step in and draw the line against workplace bullying. For many, it’s not easy. Sharing one’s story, even self-identifying as a target during, say, a phone call with a legislative staffer, means revisiting very difficult stuff. But those personal stories are helping to drive the forces for change. Especially for those people, I hope that being a part of a broader response to their own terrible experience is a life-affirming way to make positive change. So many social movements leading to legal reforms — the civil rights movement, the women’s movement, the LGBT movement, to name a few — have been fueled by people who have experienced injustice and abuse. Why not this one?